For all it's exhaustively catalogued problems , Battlefield 4 is still... well, Battlefield 4. And, as the sequel to a game that was in part notable for its unusually placed boats , it's no surprise that even around the crashes and bugs, the spark of freeform military invention is still live and well. 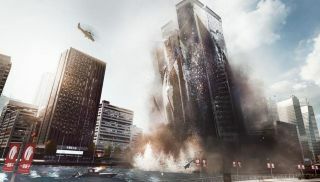 As you can see from this video, where a group of players climb into a Jeep, and make an explosive entrance onto Shanghai's skyscraper. This is the second type of Battlefield video then, the first being astoundingly executed trick shots . But as silly as this group's antics may be, the joint rocket/sniper assault on an attacking helicopter is still an impressive piece of play.